Beijing - Rather than pay medical bills, a Chinese woman cut into her own belly with a kitchen knife to relieve herself of fluid congestion. Wu Yuanbi, a 53-year-old migrant worker living in Chongqing municipality, had declined for years to buy medical insurance because she wanted to save money. After the media reported about her self-performed surgery, she was taken to a hospital in Chongqing and is now receiving treatment free of charge. Wu, who moved with her family to Chongqing in 1989 in search of better-paying jobs, has been suffering for about 13 years from Budd-Chiari syndrome, a chronic condition that caused her stomach to fill with fluid. In 2002, she and her family pooled their savings to pay for a procedure that resulted in the removal of 25 kilograms of water from her midsection. But a relapse of the condition followed and the family found itself too poor to pay 50,000 yuan ($7,686) for a second operation. Desperate to relieve the pressure in her stomach, Wu slit herself open with a kitchen knife on May 8. 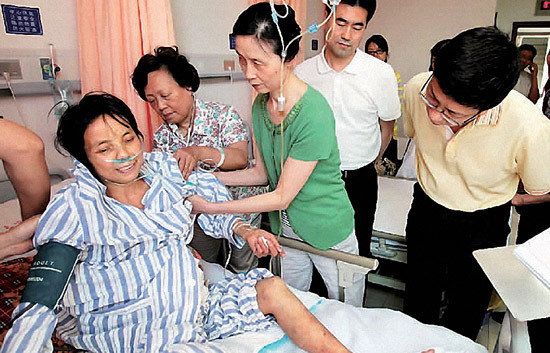 When she performed the surgery, her husband, Cao Yunhui, had already left for work, and she had to endure intense pain for hours alone on her bed. Cao returned later in the day to find his wife with a 10 centimeter-long wound in her belly, lying in a pool of yellow fluid mixed with intestines. She was rushed to the hospital and saved. "If I had passed away, I would have at least spared my family the trouble of looking after me," she said later. Wu Ming, a professor at Peking University's School of Public Health, told China Daily that it was once common for poor rural families in China to go bankrupt after they had paid high medical costs. But "the situation improved greatly with the introduction of a national health insurance policy that is highly subsidized by the government to make basic healthcare more accessible to rural people", she said. The policy, which was introduced around 2003, enables qualified persons to obtain insurance by paying premiums of less than 50 yuan a year. In return, beneficiaries will receive reimbursements equal to 70 percent of the cost of their inpatient medical care, according to the Ministry of Health. To ensure there is enough money to meet those obligations, the government pays a 200-yuan subsidy for each person covered by the policy, called the new rural cooperative medical scheme. Without that help, Wu's family, which lives on a household income of less than 3,000 yuan a month, could hardly afford to bear the full cost of medical treatment. Cao Yunhui, the husband, said the family had turned on occasion to the local government for medical assistance. But the government only paid for certain procedures and a surgery to remedy a stomach ailment like what Wu suffered from was not one of them. "They asked us to subscribe to the new rural cooperative medical scheme," Cao recalled. "We didn't bother to do the procedures that were not covered." Qiu Renzong, a bioethics researcher at the Chinese Academy of Social Sciences, said the premiums charged by the policy are very reasonable. "To get more people to take advantage of it, the government should further promote the program," he said.